It’s spring and actually the weather around here is going to start feeling that way! YES! Our spring fever is in full swing. We can’t wait to be out there in 60s, 70s, 80s, 90s, 100 degree days creating the landscaping design you want. Our drive comes from knowing the landscape makeover we design for you will encourage evenings having bonfires, roasting marshmallows, hanging out with friends & family, and enjoying a cold beverage. These landscaping ideas will bring your outdoor living to life! 1. This paver patio with an added pergola, pillars and fire pit (under the wooden table) is beautiful and perfectly functional for this family. They enjoy entertaining, and with this space, they will be volunteering as hosts for the evening. 2. This paver patio also includes pillars with a pergola. The style of table and chairs creates a look that is great for enjoying a cup of coffee and reading the newspaper in the early morning hours when the dew is still out (but note, your shoes or feet won’t get wet with the morning dew when you have a paver patio. Bonus!). 3. This design is so unique and people will stop when walking by and stare. How unique and creative?! With this design, in the first section, one could add their grill with a table for the ‘master chef’ as he/she exits the back door and then in the back section add a seating area. Such a beautiful design with pavers. 4. This multidimensional paver patio is another great way to entertain friends, family and holiday gatherings. 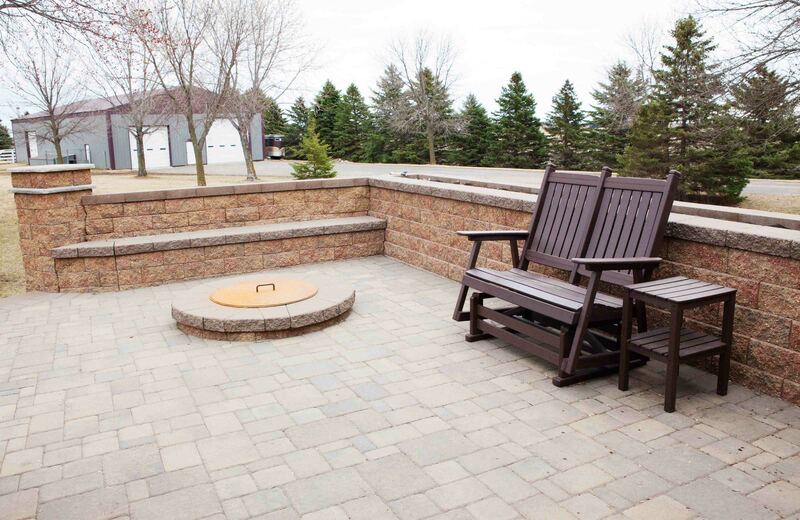 In this design, this family created a seating area with the pavers that outlines the left side of the fire pit. Add chairs and tables as more people arrive or keep it intimate with just the family. 5. Another gorgeous design, this time incorporating color in the pavers to create this beautiful look. A great way to enjoy your mornings looking out at the landscaping design while sipping on coffee and when the evening hours come, pull the chairs towards the fire pit and roast some marshmallows. Don’t forget the tunes, too. We hope these 5 landscaping ideas will help inspire you for your outdoor living area. Remember, think about what is functional for you and your family and what you want your outdoor area to be for you. Do you want to entertain, do you want to have a place for the kids to ride scooters, or do you want to make it a useable area? Contact Leading Edge Landscapes and we can help create the design that works for you.